How Can You Tell You May Need a Knee Replacement? Knee replacements are among the most common surgical procedures performed in the United States, with 719,000 performed each year, according to the Centers for Disease Control and Prevention. When knee pain interferes with your everyday activities, it may be time to consider surgical intervention. Your Jacksonville orthopedic surgeon can help you determine whether a knee replacement is right for you. There are two main options for knee replacement: total and partial. In a total knee replacement, your orthopedic surgeon will replace the surfaces of the end of the femur (thigh bone) as well as the top of the tibia (shin bone). This completes an entirely new knee joint that reduces friction and pain associated with movement. The majority of knee surgeries performed in the United States are total knee replacements. A partial knee replacement involves just one part of the knee. Often, this is the inner side of the knee, although the outer side or kneecap may be affected. In a partial knee replacement, your orthopedic specialist makes a smaller incision using minimally invasive procedures. This often results in a shorter recovery time. Some of these symptoms may be managed through the use of a cane, medications or non-pharmacological approaches to pain management. 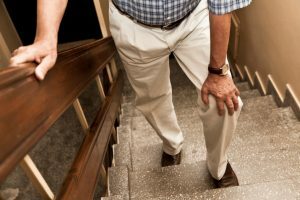 However, if the use of medications or a cane does not alleviate symptoms, it may be time to get a knee replacement. To see if you need a knee replacement, contact our Jacksonville orthopedic surgeons at Southeast Orthopedic Specialists. Following a comprehensive evaluation, your surgeon can help you decide if knee replacement is appropriate for you.